Bernard Hocking's is a Newcastle builder who prefers to build more sustainable homes. 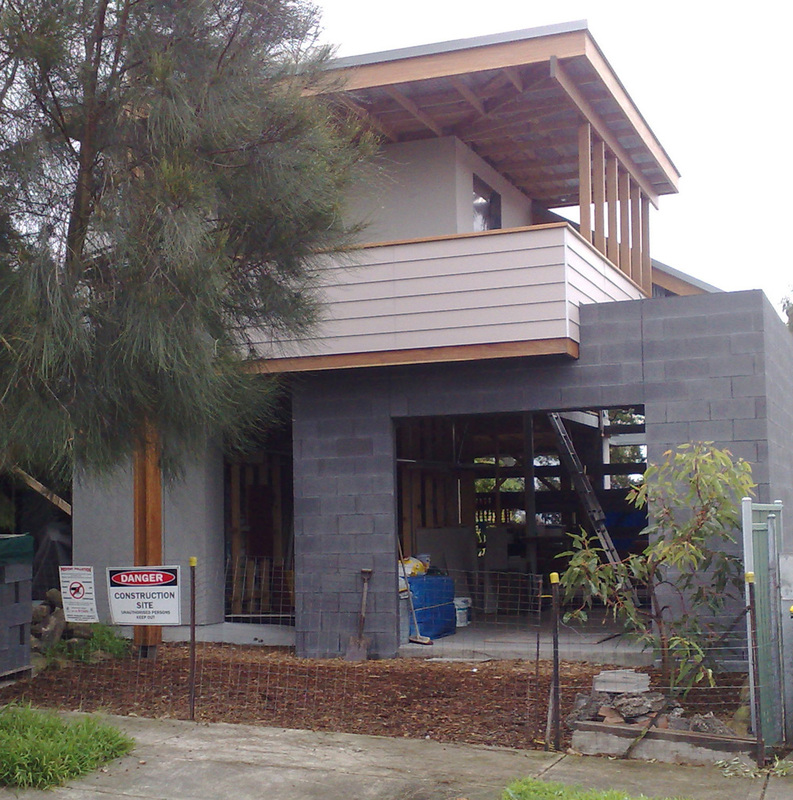 During winter 2010 he has been working on a three bedroom, architect designed home in Newcastle, NSW. According to Bill "It's an opportunity to trial and showcase some of the best sustainable products and practices currently available." The finished house will be independent of mains water supply and sewerage systems. Nine star thermal performance combined with efficient appliances and on-site energy generation will enable it to be a net exporter of renewable energy. Materials and construction methods have been selected that minimise embodied carbon emissions and ecological impacts, without compromising aesthetics and functionality, enabling the project to be carbon negative over its life cycle. The project required approximately 45 m2 of charcoal coloured face blocks, mainly in fire-rated walls directly on the boundary. Bernard wanted to use TecEco Eco-Cement in these blocks primarily for their potential to minimise net CO2 emissions and he approached Bill Martin of Adbri Masonry Newcastle for assistance. According to Bernard, Bill and his staff went out of his their way to help, working with him and TecEco to deliver blocks that minimised CO2 impact whilst meeting expectations for strength, durability and appearance. John Harrison from TecEco suggested to a first replace 2/3 of Portland cement in a standard mix with reactive magnesium oxide supplied by his company. The remaining Portland cement contributed to early strength but according to John more importantly provided optimal chemistry for carbonation of the magnesium and calcium hydroxide phases produced during hydration. About 50% of the mix was bottom ash, a cementitious waste product from coal fired power stations. Fines were reduced to increase porosity of the blocks, improving the rate of carbonation whilst keeping clean, sharp edges essential for a neat appearance of face blockwork. Black oxide was added to give the required colour. Water content was slightly over 4%. According to Bill Martin the blocks went through the process well, transported without chipping or breakage, cut well, were easy to clean and the appearance, strength and other characteristics were excellent. He said the result was a block that looked much the same as Adbri Masonry's range of architectural coloured smooth blocks but with a slightly more open texture. Of interest to our mimics/competitors: The blocks were transported two days after manufacture and laid four days later with no breakages. No special carbonation rooms or other conditions were required and they were treated like every other concrete block made in the factory. They also showed much less efflorescence than normal blocks. To build the wall shown in the photograph of the partially completed Hocking's Project home a high-strength Tececo Eco-Cement mortar was used. John Harrison suggested a formulation of 1 part Portland cement to 3 parts reactive magnesium oxide which he supplied and 12 parts double-washed coarse beach sand that Bernard obtained locally. A higher proportion of sand could have been used but Bernard wanted high strength for walls on the boundary, which had parapets and were adjacent to where vehicles entered the garage. Normally using double-washed sand minimises efflorescence and the low clay content improves strength and minimises shrinkage but unfortunately such mixes are normally very bony and the bricklayers do not like them. According to Bernard the TecEco Eco-Cement formulation was worth using just for improving workability. He made clear when he said "The use of a TecEco Eco-Cement blended Portland cement - magnesium oxide binder resulted in a highly workable mortar with no need for added lime or fireclay." Bernard's conclusion was that "There's a great future for Eco-cement blocks and pavers. I've long been a fan of cement blocks anyway. They can utilise waste products such as bottom ash, crushed concrete, wood fibre, hemp and even recycled glass. They don't leach or off-gas and require little or no maintenance. They're readily recyclable and provide a strong, durable, termite proof cladding that, with appropriate construction methods, need no painting or waterproofing. They make very efficient use of a small amount of cement – less than cement-stabilised earth blocks or rendered straw-bale walls. 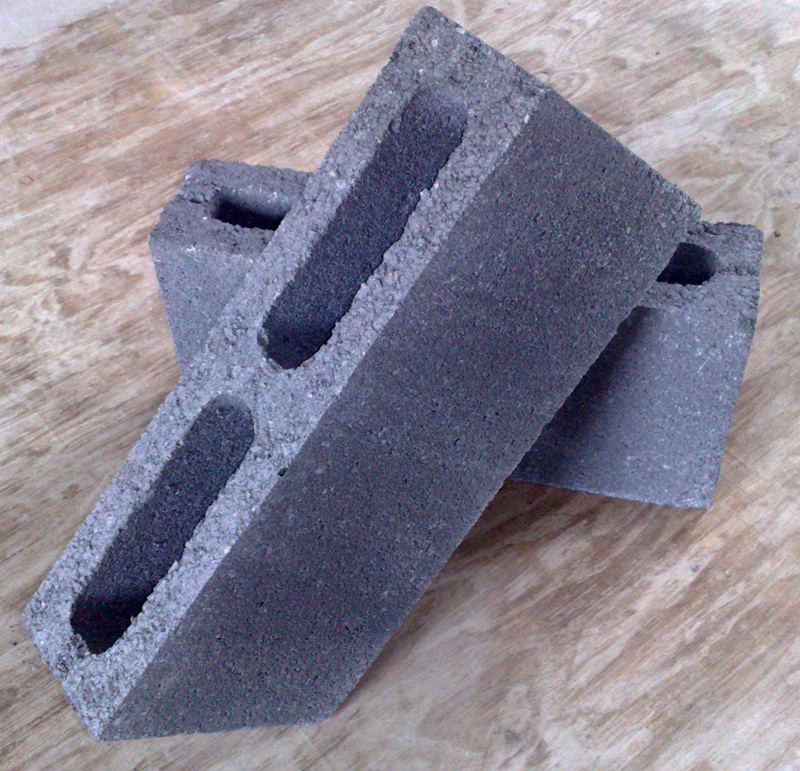 Partially replacing portland cement with magnesium oxide minimises CO2 as the blocks set by absorbing the gas . Finally I must congratulate the local manager of Adbri Masonry Bill Martin and his technical and production personnel who could not have been more helpful. They showed a genuine commitment to supporting innovation and improving environmental performance. I look forward to TecEco Eco-Cement blocks and pavers becoming readily available commercially." Editor's note: The manufacture of reactive magnesia without releases in improved production facilities would give TecEco Eco-cement blocks the potential to be net carbon sinks – a truly sustainable building product.